The Q-Connect Q15CC Cross-Cut Shredder is suitable for small office or home use and is capable of shredding up to 15 sheets of 75gsm paper at a time. The shredder shreds paper into particles measuring 4mm x 30mm, so has a P-4 security rating, ideal for the shredding of highly confidential documents. This means that each A4 sheet is shredded into approximately 524 pieces! Recommended usage for the shredder is 50 passes per day and it can be used for up to 5 minutes continuously, after which it needs a 20 minute cool down period. In addition to paper, the Q15CC will also shred small staples and paperclips - plus, it can shred credit cards and CD/DVDs too, very handy when it comes to shredding old bank cards or CDs with confidential data on them. The waste bin is an easy to empty pull-out style and it will hold up to 35 litres of shredded paper before it needs to be emptied. 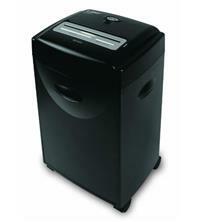 Other features of the Q-Connect Q15CC Cross-Cut Shredder include: Automatic start and stop (the shredder automatically starts when paper is inserted and stops when it has passed through); an off switch; both reverse and forward functions to help clear jams; a slide cover with handy separate feed slots for paper, CDs/DVDs and credit cards; a 230mm shred width opening (suitable for A4 paper shredding); safety cut-out if the waste bin is opened; overheat protection; castors for improved mobility; and low noise output.